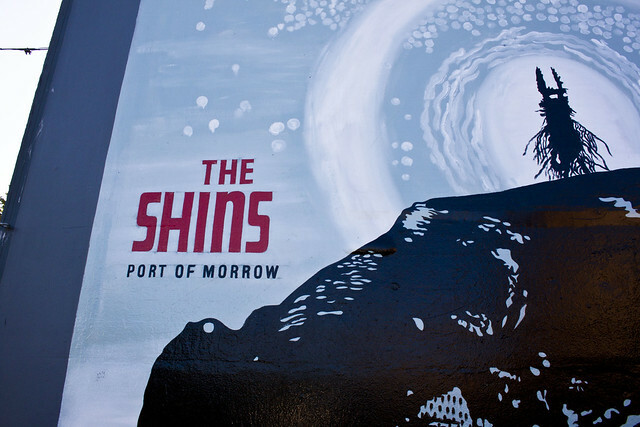 The Shins’ Port of Morrow album cover painted on the side of a record shop north of the Seattle Center. I think it was Silver Platters. I have to thank my brother for introducing me to The Shins several years ago, back when I found out about Rilo Kiley. The shop reminded me a little of Empire Records, but I never went in to see what it was truly like. I miss the days of going into a music store, putting on the puffy head phones and absorbing the music as it came into my ears….remember those days? Like in Radiohead’s Creep? The Shins will always remind me of my first few years of college. I have some Shins songs on my iPod and in the car- I haven’t ever listened to a whole album by them, though. I’ve just collected the songs off of soundtracks and compilations and singles. I just realized that now. I need to do that- I bet I would love their albums.